The violent crackdown on nationwide protests by Zimbabwe security forces was met by deafening silence from the country's neighbours and the Southern African Development Community (SADC) regional block. The violent unrest erupted after a steep hike in the price of fuel. The level of force used on those who died or injured and supported by medical reports pointed to police brutality, giving rise to fears that under President Emmerson Mnangagwa's leadership Zimbabwe is sliding back into authoritarian rule. The unrest drove Mnangagwa to cancel an appearance at the World Economic Forum in Davos, where he had been expected to pitch for foreign investments, and fly home. In his first public comments since cutting short a foreign trip and returning to Harare, the president said "violence or misconduct by our security forces is unacceptable and a betrayal of the new Zimbabwe." "Misconduct will be investigated. If required, heads will roll," Mnangagwa tweeted, calling for a "national dialogue" involving churches, civil society and the opposition. When South African President Cyril Ramaphosa finally spoke out about the situation in Zimbabwe, many expected him to condemn Mnangagwa over the deaths of at least 12 protesters, the arbitrary arrests of hundreds of people, the two-day internet shutdown, and other abuses. Yet Ramaphosa did not address these concerns and instead called for the United States government to lift sanctions on Zimbabwe and announced that his government was in discussions with Harare about how best to help. "It is no longer necessary to have sanctions against Zimbabwe right now, because they have embarked on democracy and a path of real recovery and we will help them best by lifting those sanctions," Ramaphosa said during an appearance at the International Labour Organization (ILO) in Geneva. Ramaphosa added that he and Mnangagwa "will meet at a later stage to see what is possible". Zimbabweans commenting on Ramaphosa's statement have been divided. Some have accused him of totally ignoring concerns over what they call "extrajudicial killings and atrocities committed by the military and police in in their country seen particularly in the recent unrest". "Ladies and Gentleman, I don't have South Africa President Twitter account, may someone help send this video to him," Victor Karonga tweeted. In the video an unknown woman says President Ramaphosa speaks about sanctions but nothing about corruption. "Sounding very much like a Zanu-PF puppet. He says nothing about the black on black violence happening in Zimbabwe right now. He speaks of a bail out package with no conditions whatsoever. Not economic reforms required. What about the human right violations Mr Ramaphosa? What do you stand for..." she asked. "It is insulting to the Zimbabwean people for African presidents to claim Zimbabwe is on the path to democracy, this within days of army killings of unarmed civilians. If you won't stand with the people, why not keep quiet? Is this the African way? What a shame," prominent lawyer Fadzayi Mahere said. "Cyril Ramaphosa asking the world to lift its sanctions on Zimbabwe but yet can't ask Zimbabwe to stop participating in human rights violations. I suppose it is because he is preparing to do the same in RSA," said another Twitter user. South Africa's main opposition Democratic Alliance plans to approach the International Criminal Court (ICC) if Ramaphosa fails to intervene directly to stop the "ongoing human rights violations" on Zimbabweans. 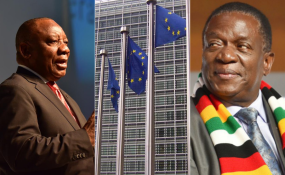 "If Ramaphosa fails to intervene and advise Mnangagwa to stop the military clampdown on civilians, the DA will be left with no option but to approach the ICC to consider a preliminary investigation into these violations as outlined in the Rome Statute," said Stevens Mokgalapa, the party's spokesperson on International Relations and Co-operation. "The truth is, all what you are saying is real but my sister it's unfortunate I really don't think you are in Zimbabwe now, it's high time these sanctions go and so we can create a better life for ourselves, whatever reforms there is to talk about are not the discussion matter. "Last I checked Ramaphosa was president of South Africa not Zimbabwe. Huffing and puffing at him for Zimbabwe corruption doesn't make sense", said another Twitter user. "People of Zimbabwe voted, I agree with Cyril Ramaphosa sentiments on what needs to be done in Zimbabwe, lift sanctions as IMF positively indicated in its report, support President Mnangagwa.Stop insulting the integrity of our President," @mnikani tweeted. "Attacking Ramaphosa for fighting the same battle of oppression she is talking about. Do sanctions affect the government, hell NO, but the same innocent people. For a Zimbabwean to fight those who want sanctions to be lifted is just crazy," says @ManyoniSpecial.